Each column can have its own vertical and horizontal alignment, font and color. Each column's text can be either clipped, appended with ellipsis or word wrapped. This allows cells with multiple lines of text. 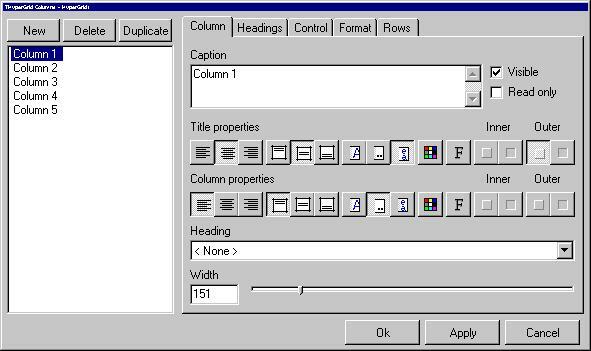 Captions for columns can be set at design time. All of the above properties can also be set for individual cells at run-time with an event handler. Headings can be specified that span multiple columns. Each heading has the same set of properties as a column. Each editable column can contain a dropdown list, a custom button or both. With drop down lists, THyperGrid provides the closest match in a tool tip as you type. Or, you can furnish THyperGrid suggestions with an event handler. Each column's data can be formatted as a currency, date, time or scientific. Additional formats can be specified via an event handler. Columns can be made invisible. Delphi 2 · Unzip the downloaded file and install HgReg.DCU as a new component. Delphi 3 · Unzip the downloaded file and install HyperGrid.DPL as a new package. Borland C++ Builder 1 · Unzip the downloaded file and install HgReg.OBJ as a new component. Borland C++ Builder 3 · Unzip the downloaded file and install HyperGrid.BPL as a new package.